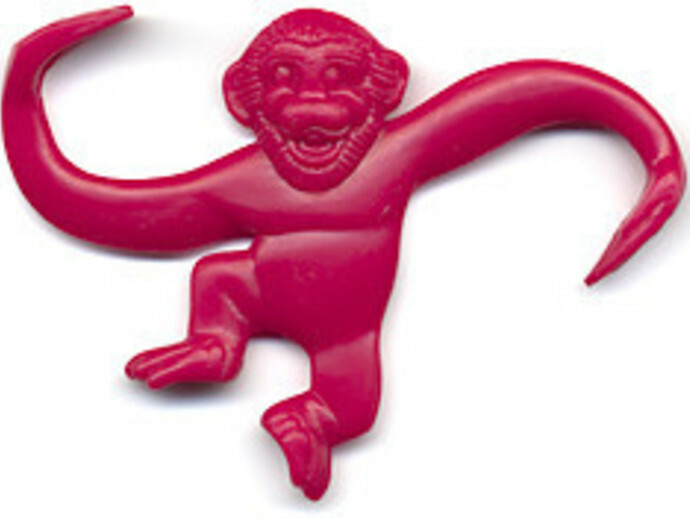 Ok, so I don’t really remember having and playing with the “Monkeys” when I was a kid. I am sure at one point or another: I had a set. I am sure I never knew there was a game you played with them and I am equally sure that there is just something fun about the very sight of these little plastic hook armed chimps! For whatever reason, the other day I was thinking about leadership and these monkeys, linked together by the arms, came to mind. I think they say a lot about leadership and couldn’t get the thought out of my mind. 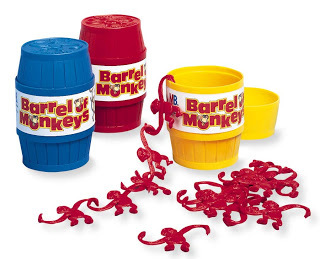 So I trekked across town and into the toy store, I had to have a barrel of monkeys! Low and behold there they hung-right on the end of the isle front and center as if calling my name. Now I had to choose a color. Ok course I walked out with a red set and the receipt. 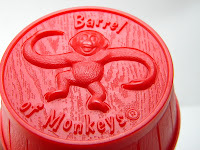 Now as an owner of a brand new set of monkeys, I saw on the label “Instructions on bottom of barrel”. Was I the only one that didn’t know this was a game and not just a goofy toy? Well I just had to play it. My opponent would be Sheila (who I am sure owned monkeys as a kid). I thought I would be cleaver and let her go first so I could watch her monkey hooking technique….I was wrong! She hooked all 15 in a long chain of monkeys without dropping one! So now it’s my turn to be the hook master! I choose my lead monkey carefully-picking one that would be hard to hook with another. Now for my very first (possibly ever!) hook! And I dropped it! I couldn’t hook the very first one! Sheila beat me fair and square! Sheila is the monkey master and I am the 46 year old fool who just bought a barrel of monkeys only to be beat by my wife! The leader carries more weight than the rest. The burden is on that top monkey! Try to sympathize with them and their weight. All of the monkeys have a smile on their face. At the end of the day, is your team happy? Even in adversary or differences, a good leader, who responds well, will have a happy team of monkeys! The team is able to handle the weight on each of them. While the leader does hold all of the weight, each team member has a job to do and a weight to hold. If you cannot handle the weight, move to the bottom of the monkey chain and work your way back up! The Leader/team is boring and no fun as long as it is in the barrel. Get out of the barrel and do what you were made to do! Each monkey has a lead arm and a load arm. I think every part of a team has a lead role and a follow role to play. What areas are you leading and what areas are you following? A good leader uses his entire team and understand each of their positions. Sheila got the feel of how the monkeys responded to her movement and the role that each of the played. She used this to her advantage and won! All it takes is one not doing its job for the rest to suffer. One monkey not hooked right or hooking right will cost the whole team. Are you doing your job? Is your team working with their strengths? How can you, where ever you are in the chain, help the rest of the team?How can you support your leader? Are you the leader? Are you handling the weight? I know this is just a kids toy but I think the chain of monkeys holds a lot of truth to the way leadership works. Don’t be afraid to reach out and take someone along with you and help them take someone along with them. All in all, we are all just a bunch of monkeys trying to hold on and hang on! Disclaimer: This isn't leadership in it's entirety, just one aspect of it. I have worked in children’s church for close to 20 years. On some Easter messages, I would get a live lamb as a visual in church. We would head out to a farm and pick one, then the shepherd would go in and get it. First of all, this experience was very humbling. See to represent the sacrificial lamb, we had to pick a spotless one without fault. Now this farm had hundreds and hundreds of sheep. You would think, that out of that many, a perfect one should be easy to fine: nope. The shepherd would finally catch one and bring it to me and I would tell him that that one wasn’t good enough or right and I would ask him to get another. This gave me some insight on what it must have been like before Jesus. It also taught me that perfection is something to be highly valued. It was these lambs that you wanted to breed and grow a better flock. So to give up the good ones was hard and costly. But this really isn’t my point. Something even more interesting I learned was that as the shepherd, the man who raised these sheep from birth, the man who fed them every day, the man who protected them, as this man stepped into the fence the sheep did something interesting: they fled away from him. Which ever way the farmer went, the sheep would go the other way. At first I thought the poor guy would never catch my needed sheep but the farmer was smart. He would move one way to get the sheep to go the other way (the way he wanted them to go). If he needed them to the left, he would go to the right. He would pick a corner to trap them in and then move in to grab the sheep. Now I had no reason to think the sheep would act different...or did I? First: “the sheep listen to his voice”, now these sheep I am talking about did not listen. As a matter of fact, the farmer used his voice to run the sheep where he wanted them to go. But with Jesus or a “good shepherd” the sheep listen to his voice, not run from it. Second: The shepherd “leads them”. I think that a good shepherd will know how to lead and not chase, trick or trap the sheep to get them where they need to be. Third: “he goes on ahead of them”, this is probably the first clue to the real life problem that this shepherd had AND many churches have with the leaders or shepherds. When “he goes on ahead of them”, I see several things: he is exposing himself to whatever dangers they may come to, then he is also between the sheep and the potential threat. I also see a good shepherd not leading his sheep anywhere he himself is not going! Notice I didn’t say “willing to go” but going. When you “go out ahead of them”, you are going there first! Anyone would say they are willing but do they go out ahead? And lastly: “his sheep follow”, These sheep did not follow. they fled. But here Jesus says they will follow! Now I know that our pastors today are not Jesus and cannot be expected to be Jesus but I do see a problem with the church today: people are fleeing away. Now most of them are fleeing towards other flocks (other churches) but rest assured: they are fleeing. It’s been found that 83% of first time church visitors are from another church. You have probably done this too, it’s ok. But you do have to figure out if the problem was with you the sheep or with the shepherd. Do you listen to his voice? Before I get into this first question, never take your faith solely from the mouth of any one man other that Jesus and His Word! Always write down the passages and look them up! If information comes from outside of this, don’t be afraid to ask for the reference and look it up! All of that being said and assuming the Word is being preached, are you listening? and by listening I mean listening and obeying? Or are you resisting what is being said? Do you lean into the messages or are you pulling away? Are you accepting the challenges or rejecting them? Because if you believe the Word is being preached and have checked and still resist, you are not just fleeing the church but also God. Repent now! Are you being led by your shepherd? Are you drawn in by the church leading you or are you being tricked into the corner? I find that when we experience the true gospel in others, we want to follow them. But too often the church plays another game: good coffee, fun music with a secular song thrown in every now and then, exciting lights and decorations. One thing you have to notice is that in John 10, Jesus never mentions using the sheep pin as a tool. The environment will not matter when there is a good shepherd. He didn’t say to clean up the pen, to paint the gates, put up better signs or give them better food in the trough. Nope everything here points to the good shepherd. It is important to have a good environment but that should not be the tool to get you there and keep you there. It’s all about where the healthy focus is. Is it on Jesus and reaching the lost? The sheep that is under a good shepherd will feel more like part of the family than it does part of the flock. Is your shepherd going ahead of you? Do you see your church/leaders doing what it is asking you to do? Are they doing it ahead of you? The shepherd here did not join the flock, he led it and went out before it. We should see every challenge in full effect by a good shepherd before we are asked to meet it. We should see the love of Christ first in them. Are they preaching on humility? Are they humble? Honesty: are they honest, integrity…. Are they cutting the path for you? Know that the leaders today are human and the person speaking in John 10 is Jesus (God) and know that we humans will fail. I am not expecting a perfect pastor or leaders in all of this rant. That, I know I will never find. I am simply saying that this may be why so many people are fleeing instead of following. Who is who: You are a shepherd if you lean someone (and you should). I am not talking about just pastors here but any shepherd. The shepherd in John 10 is clearly Jesus and while we are not The Good Shepherd, we are called to follow Jesus and do what he did. and he lead people and you are a sheep if you are following under someone (and you should). Please don’t be offended that I call you sheep. Jesus did it first and it is an honor to be a sheep under a good shepherd! But as a sheep, are we following our pastors? Are we following our Good Shepherd: Jesus? If not, start now! As a pastor/leader are you a good shepherd? Are the sheep your true concern or is your job or your paycheck, your comfort or even your pride? Are the flock more apt to flee or follow? I find that a good shepherd needs no tricks or methods to get the sheep to listen. Being good is all. John 10:11 “I am the good shepherd. The good shepherd lays down his life for the sheep. That is a shepherd worth following! One more concerned with the flock than his own life (whether it be his safety, his comfort or his paycheck). If you find that more people under you flee than follow, you also have to ask: is it bad sheep or am I a bad shepherd. Jesus has given us everything we need: The example of following him, the instruction in His word, the gifts and the power through the Holy Spirit to accomplish the work He has already set aside for you to do. Stop trying on your own and start leaning on the Son.